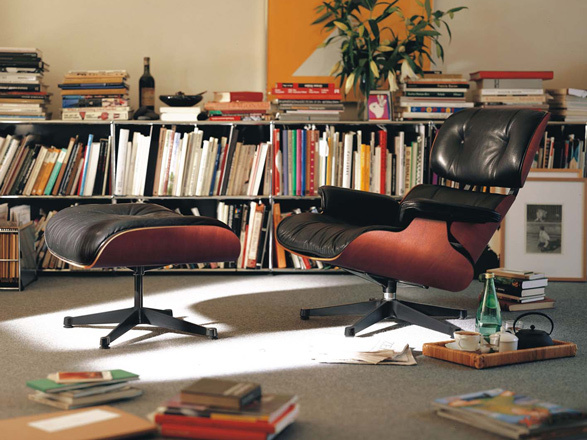 The Eames Lounge Chair, originally designed in 1956, has seen phenomenal success since its inception. Regarded as the ultimate luxury item in the post-war period, the chair’s authority and desirability has only increased as the decades have past. In the 1970s it became ‘the’ executive chair, a must-have for all business execs, and today, over 50 years after it was first created, it is seen as the height of modern design and as the piece representative of the revolutionary mid-century modern era as a whole. The Lounge Chair and Ottoman, are both made at Vitra’s headquarters and factory in Weil Am Rhein, in Germany. When we visited we were given an exclusive insight into how this iconic item is made, so we thought we’d share this unique process with you today. The chair and ottoman’s instantly recognisable wooden shell is pre-bent by specialist craftsmen in Germany, just over the border from Weil Am Rhein, and then carefully shipped to the Vitra factory. As the shell is made from the natural material of wood, all components have slightly different grains, colours and patterns. To ensure the grain on the ottoman matches that of the chair, Vitra have a specialist who will match the woods together by eye – hand selecting the same grains and finishes to get the best match. This level of accuracy, attention to detail and all-round quality of care is repeated throughout the manufacturing process and is clearly something that Vitra pride themselves on. The video below shows how the label of authenticity is applied to the base of the ottoman, and then how the leather pad is attached to the wooden base. The craftsman applies the label with a custiom-made devise that ensures all labels are placed in the exact same position, every time. Also, when the leather pad is attached to the shell base, we can see that the pad is attached via a series of aligned studs and clips. This is to ensure that there are no unsightly screws or attachments on the base of the ottoman. The video also shows the ottoman in its final stages – just as the metal base is fixed in place. Again, we can see the precision with which this is lined up and attached. After the base is screwed on, the metal work is given a final polish, and is carefully wrapped ready for transportation. Thirteen Lounge Chair and Ottomans are made per day at the factory. When this is compared to the Aluminium Chair, where up to 300 can be made in a single day, this emphasises how much time and effort and each and every Lounge Chair commands. To test the longevity of their goods, Vitra have an on-site testing room where all their items are quality tested - jokingly labeled the ‘torture chamber’ by campus staff. Interestingly, the Lounge Chair was tested here for a continuous period of 3 years, the equivalent of over 125 years of day-to-day use, and was still in full working order at the end. This type of quality just cannot be replicated and shows that when you purchase an authentic original, you are investing in an item that will last for generations to come. The Eames Lounge Chair collection has grown over the years and now includes a large version, a white leather version and now, an all-black version. 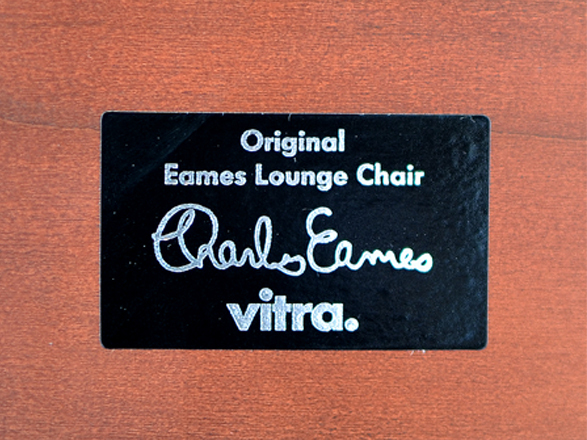 To see the full range head over to our Eames collection.